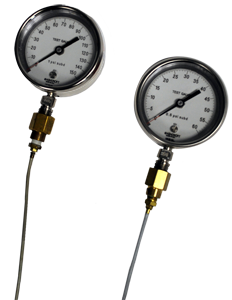 The 9776 Pressure Calibration Gauge is used to verify the calibration of a gauge or digital readout on an air-operated piece of test equipment manufactured by the TECH® Products division of Altek. The 9776 is also useful as a tool for verifying system flow rates and leak detection. The 9776 is connected to the calibration port on the unit to be calibrated. Air pressure is applied, and the gauge or digital readout of the unit under test is verified against (and adjusted to match, if necessary) the reading on the 9776.